Ad Astra Games is pleased to announce Saganami Island Tactical Simulator, the official space combat game of the New York Times best selling Honor Harrington series, by David Weber, with full miniatures support! 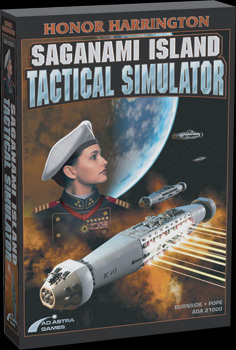 Building on the Origins Award-winning 3-D engine from Ad Astra Games’ best selling Attack Vector: Tactical, Saganami Island Tactical Simulator brings the fury of Honorverse starship combatimpeller wedge missiles, X-ray laser warheads and grasersto your gaming table! Card-driven special character rules let you recreate the most dramatic moments in the series, without distorting tactical game play! Brimming with information about the naval architecture and doctrines of the Honorverse, Saganami Island Tactical Simulator is a must-have purchase for any fan of the series! The groundbreaking 3-D Spaceship Combat Game that’s fast enough to be fun, and accurate enough to get raves from the editor-in-chief of Scientific American! The Nexus Journal is a regular supplement that covers new material for Attack Vector: Tactical and the Ten Worlds Setting. Blow your opponets out of the sky with the Mansur class keel gun cruiser! GURPS Traveller author Loren Wiseman explores the Machiavellian intrigues of Schwarzvaal! Read the plans for the desperate assault and defense of Krasnaya Svezda from both sides, including a briefing paper on how planetary assaults work in the Ten Worlds setting!